When Life Gets In My Way: Say "Aaaahhhh!" 1974 Diary entry: August 20th - Dear Dairy, Yesterday the denist took the thing out of my mouth. I was glad. I don't know what to do. Note from present day self: Oh, dear girl. I remember that horrible thing. 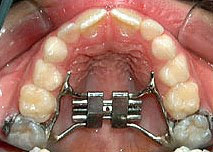 It was called a palate splitter. Every time it was "turned" to expand gave you headaches. It ended up actually changing the shape of your face, I believe.